Sumerians actually called themselves "ùg sag gígga" (black-headed people). Hebrews called southern Mesopotamia: "Shinar." In late 4th millennium BC, numerous city-states in Sumer thrived. Each city centered around a temple and its patron god or goddess. Either a king (lugal) or a high priest (ensi) governed the city-state. The five cities that practiced pre-dynastic kingship were: Bad-Tibira; Eridu; Larsa; Shuruppak; Sippar. 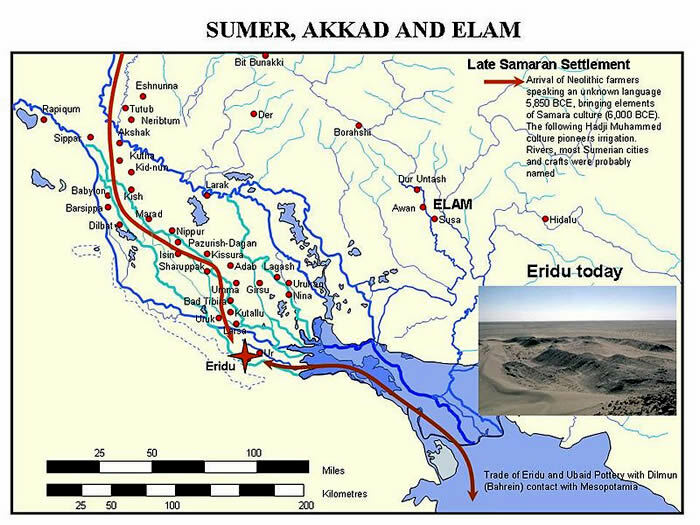 Other major city-states included: Akkad; Girsu; Lagash; Mari; Nippur; Umma; Ur; Uruk. Gilgamesh (circa 2500 BC) was the 5th legendary king who built the walls of Uruk. A massive flood destroyed cities throughout ancient Sumer (similar to the story of Noah and his ark). Kish was another major city that vied with Uruk for dominance. King En-me-barage-si (circa 1600 BC) reportedly built the first temple to Enlil in Nippur and defeated the forces of Elam. King Mesilim of Kish (circa 2500 BC) built temples at Adab and Lagash, according to recovered archaeological documents. Sumer troops and their bulky, four-wheeled chariots dominated the battlefields. The first historically recorded king of Ur was Meskalamdug ("hero of the good land"). 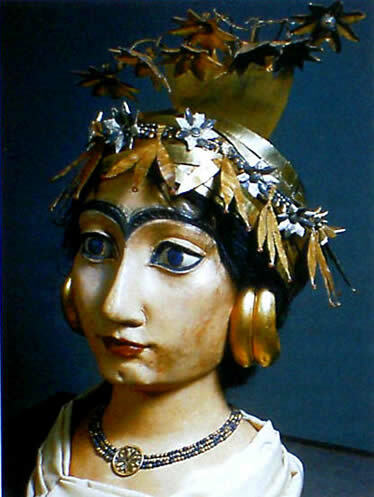 Mesh-Ane-pada ("youngling chosen by An"), was the first king on a list for the dynasty of Ur (circa 25th century BC). He overthrew king Lugal-kitun of Uruk and conquered Kish. Uruk was a key city-state and had a population of 50,000-80,000 circa 2900 BC. Originally Uruk was formed as two Ubaid towns merged. It lost prominence circa 2000 BC, during a struggle between Babylonia and Elam. People eventually abandoned the city during an Islamic conquest of the Sassanid Empire between 633 and 654 AD. In the 25th century BC, king En-hegal of Lagash paid tribute to Uruk. Circa 2500 BC, king Ur-Nanshe became independent, defeated Ur in battle, and captured King Pabilgaltuk of Umma. His city also received tribute from Dilmun. His grandson, Eannatum, expanded the kingdom by taking Kish, most of Sumer, and exacted tribute from Mari. At the end of the 3rd millennium BC, Ur-Kasdim formed a highly centralized bureaucratic government. Men typically wore a long skirt. It was a wealthy trade center in the early Bronze Age and the most important port city on the Persian Gulf. Its independence ended upon conquest by Sargon the Great of Akkad. In 1254 BC, Gutians from the Zagros Mountains destroyed the Akkadian Empire. King Ur-Nammu (2047-2030 BC) founded the Third Dynasty of Ur. He built the famous Ziggurat of Ur and improved irrigation systems. The Code of Ur-Nammu preceded that of Hammurabi by 300 years. Shulgi was the greatest king of the dynasty. He reformed the government into a highly efficient bureaucracy and ruled at least 42 years. Ur likely reached a population of 65,000 during his rule. Ur also controlled the old city of Eridu. Between 2200 and 2000 BC, drought conditions eventually reduced Ur's population by 93% and nomads twice sacked the city. 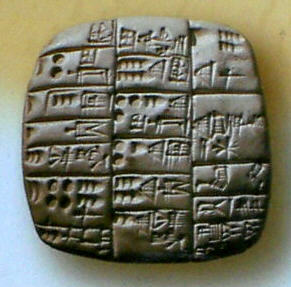 The Sumerian language also died out during this period.